There are times when you realize that people are just going to be critical of you no matter what you do. It's at those times that you just have to shrug and rhetorically ask, "What can you do?" Israel finds itself in that position often. As the only true democracy in the Middle East with neighboring countries committing human rights abuses on a daily basis, Israel is considered by the United Nations to be the worst violator of human rights -- not Iran, North Korea or Syria. At the end of last month, The U.N. Human Rights Council completed its final session in Geneva and adopted four resolutions condemning Israel, which is four times more than any of the other 192 UN member states. Amazing! The current partial blockade of Gaza is because of the terrorist group Hamas’ efforts to re-arm following last summer's war. Israel allows all humanitarian goods to be brought into Gaza. Further, Israel isn't the only nation currently blockading Gaza, as Egypt has blockaded it on its own border. It's truly unbelievable that the chief executive of a group that has the phrase "Human Rights" prominently in its name has chosen to use Israel's relief efforts following the earthquake in Nepal as an opportunity to criticize Israel and its decision to defend itself. If I were part of Roth's organization, I would have strongly counseled him to commend Israel for its support of human rights during this natural disaster and save his criticism for a more appropriate time. My friend and fellow James Madison College at Michigan State University alum Ari Kohen, a professor at the University of Nebraska, blogged about Kenneth Roth's egregious tweet today also. 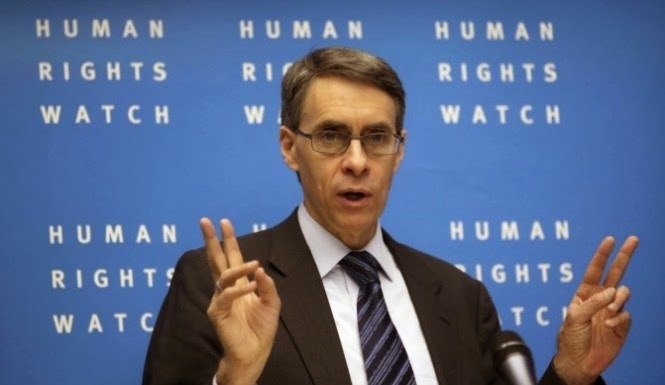 While Kohen says that for many years he has defended Human Rights Watch against charges of anti-Semitism, he has thoughtfully charged Human Rights Watch with anti-Semitism for this statement because it "holds Israel to a standard by which no other country in the world is held, singling out Israel for criticism even when it assists people who are suffering." Kohen continues, "When it comes to Israel, Ken Roth’s bias is unmistakable. There’s a grand total of one tweet from him about the tragedy in Nepal... criticizing Israel for sending medical aid. What an embarrassment." I will take this opportunity to express my pride that Israel, once again, has come to the aid of a foreign country during an emergency situation where lives are on the line -- including over 100 Israelis who are currently missing in Nepal. I will also offer my condolences to the mourning families of the victims and my prayers of healing to the injured. who had to run last summer to the bomb shelters, I call on all Jews with a conscience to not to forget the humanitarian crisis in Gaza that Israel caused and perpetuates but rather to invest in the rehabilitation of Gaza, to end the siege there, and to take responsibility for the disproportionate use of force that we exercised there. Hi Jeremy. Even if you think Ken Roth is right, do you really think his comment is appropriate? I don't. Hi Jeremy, Even if you think you are right, do you really think your comment is appropriate? I don't. @Jeremy Milgrom: Based on your comment above I'm truly embarrassed that you are a rabbinic colleague of mine. Your comment is inappropriate as others have already pointed out. I took a few minutes to read some of your viewpoints with regard to Israel and I'm left thinking you might be a self-hating Jew -- if not, then an anti-Zionist at the least. Your public position on Israel in general and Tzahal in particular, disturbed me greatly as I have learned a great deal from your father, z"l, who was a tremendous Torah scholar. I certainly hope you will apologize for your comment on my blog. Whether you choose to commend Israel for its humanitarian aid in Nepal is up to you, but to join forces with the executive director of Human Rights Watch and use this as an opportunity to chastise Israel about its Gaza strategy is absurd. @Jeremy Milgrom: The murderous terrorists of Hamas and Islamic Jihad launched thousands of missiles into Jewish civilian population centers, dug kilometers of terror tunnels leading into Israeli kibbutzim and towns, and placed its missile launchers, weapons caches, and command centers inside of and alongside schools, hospitals, and residential buildings, in a deliberate, criminal attempt to maximize civilians deaths during the retaliatory strikes that Israel carried out in self-defense. Hamas and Islamic Jihad freely admitted doing this, proudly declaring that "we love death as much as they love life". Israel, for its part, did everything within reason, and more, to minimize civilian casusalties, going to far as dropping thousands of warning leaflests and making tens of thousands of phone calls to civilian residents in advance of its defensive strikes. And yet, according to you, it is not Hamas and Islamic Jihad, but rather Israel, who "caused and perpetuates" "the humanitarian crisis in Gaza". But I guess I shouldn't be surprised at such a cruel and flagrantly outrageous moral inversion, coming as it does from a egregiously shameless self-hater such as yourself. "One who is compassionate to the cruel will ultimately become cruel to the compassionate." To Rabbi Jeremy Milgrom: you sound like a self hating Jew with your comment. What was Israel supposed to do? Allow the tunnels to be completed and invite Hamas in to kill, kidnap civilians? Should Israel shoot unguided missiles into Gaza just like Hamas to even the playing field? Israel didn't ask for the war. It was started by Hamas because, as all other Islam related terror, the world is letting it happen by standing by and doing nothing. Grow up Rabbi. Do a little fact finding befor you blame Israel . You sound like a UN mouthpiece. Jeremy (no desire to call you Rabbi) --- We ran to the shelters too... I am shocked that you don't drive 1.5 hrs away, and find an organisation in Gaza with which you can diligently work to rehabilitate Gaza. It could even be associated with the UN so you would get permission to go. Otherwise, you are not a self hater, but not truly dedicated and just a headline grabber. Oh, just to also let you know, I would define myself as a supporter of land for piece, and spent 20 years in the IDF (Conscript and military, in combat). Hamas can end the siege tomorrow by agreeing to no longer shoot rockets at, or try to infiltrate terrorists into, Israel. Given that it's hardly much to ask of Hamas to stop murdering Israeli civilians, why do you put the burden on Israel? I am embarrassed that you call yourself a rabbi. This is not to say I consider myself a rabbinic scholar, only that your aversion to discussion with Rabbi Milgrom is the opposite of Talmudic tradition. Rather than address the substance of his claims, you accuse him of being a self-hating jew?! Wow - what a lesson. Israel may very well be justified in all of its military actions, but it is not anti-zionist or self-hating to suggest that we take ownership of the effects of these actions in ways that don't jeopardize Israel's safety. I commend Israel on helping Nepal but please don't even pretend that the situation in Israel is humane. Israel crossed the line ages ago about what is self defense and what constitutes as humane treatment. Israel continues to put American Jews in the position of having to decide between Israel and humane treatment of Palestinians. Israel certainly has its positive side and I will always be for a Jewish state but the days are long past gone that Israel has crossed the line from self defense to killing innocents. He is dead wrong because his comment is not true. It is easy for him to forget the large number of Palestinians receiving treatment in Israeli hospitals (including the young daughter of Hamas leader http://www.telegraph.co.uk/news/worldnews/middleeast/israel/11174416/Hamas-leaders-daughter-treated-in-Israeli-hospital.html ), or the wounded from Syria that receive free treatment in Israel. Israel is helping despite of the conflict. The situation in Gaza is bad and will remain bad as long as they will continue to deny Israel right to exists. The UN already confirmed the blockade to be legal due to valid security concerns, his plead should go to Hamas and not Israel. It's telling that so many people are attacking Jeremy for speaking his conscience. If I hear one more time that Israel's field hospital in Nepal is somehow connected to the conflict with the Palestinians, I'm going to permanently block the person saying so on the grounds that they're stupid. Here's the thing: Israel is an entire f***ing country, with all the complicated impulses and competing agendas of any human society. It is perfectly capable of being involved in two completely different things at once, of being angelic in one arena and terrible in another, just like every other country. The IDF doesn't go to Nepal to avoid the Palestinian issue. It goes because Israelis have honed emergency medicine into an art form, and because the IDF has never quite shed its founding culture of adventurousness, and, above all, because there are people out there who desperately need help. Those who see in every good news from Israel "hasbara" are missing the single most important fact you can know about Israel -- that it isn't a political campaign begging for your vote. It is a nation. With two million schoolchildren, dozens of cities, its own cinema scene and a language spoken nowhere else in the world. It doesn't go away if it loses some imaginary popularity contest. And as with any human society, it offers an endless stream of failures and successes that will let you "prove" any damn narrative you want. So go ahead and hate Israel. Or love it. It doesn't really matter. The reality of Israel isn't affected by whatever weird story might be playing out in your imagination. Like so many of my fellow Israelis, I'm desperately proud of the Israelis who are literally saving lives today in Nepal. And also like them, I don't give a damn what you idiots think about it.